Ever have that moment where you wish you didn't throw away a piece of clothing? Well. I've had that moment ladies! A few weeks back I threw away 3 different camis because I hadn't worn them in awhile and thought, I wouldn't be wearing again. In the trash they went. Well in the midst of getting ready, I needed a camis, my camis, the one I threw out. I'm literally talking to myself in my closet saying "Why would you throw away 3 camis?!" Needless to say I'm shopping for camis now. Camis are an indispensable item every women probably has or should have in the wardrobe as I decided to provide you 5 easy ways to style the perfect camis. A lace cami paired with some high-waisted jeans, topped with a moto jacket. Sometimes, lace can give the impression that you are wearing lingerie, this will add some edge to your look. Wear your camisole with a pencil skirt for just the right amount of sophistication. I love a good v-neck t-shirt, but a v-neck cami with a pair of boyfriend or skinny jeans can also add the perfect touch to any casual look. It's no secret that I love prints, so a printed cami is a must. Where it with an a line skirt or full skirt for a little touch of flirtiness! Lastly, camis can be worn in the corporate world. Cover it up with a blazer, and you are good to go! 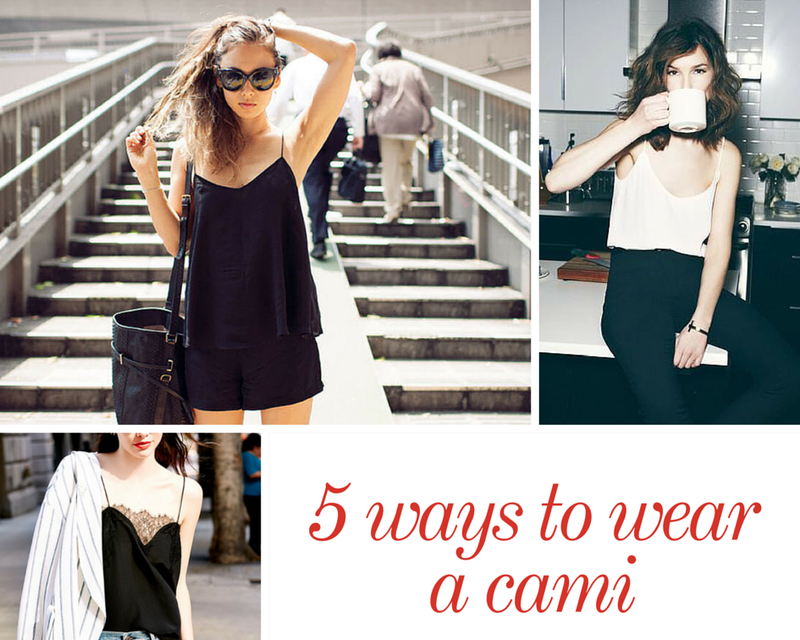 Hope these tips helped and that you will try adding a cami to your wardrobe. Im not much for a cami but these ideas are cute! Thank you for Sharing!! I wear camis under EVERYTHING, but I never thought to wear one solo. Great ideas! I love camis in the summer. Light and airy, they are perfect for layering without worrying about getting to warm! Camis are the best, and this totally makes me want to go buy some more and try them with new things. I have a blush moto jacket this season, so maybe a black lace cami! Thanks for the idea! Great looks! Thanks for sharing! Love all the looks!! I wear one everyday! Great tips! Ah what a bummer!! Good excuse to buy new ones haha! Love the first pic, the cami with the shorts, that outfit looks so comfortable and stylish! Good luck with cami shopping!